Congratulations to DeAnna Knippling, L.S. Hawker, and M.L. Rowland, who have been selected to be on the faculty of the upcoming Pikes Peak Writers Conference in April 2016! Descriptions of their workshops follow. What makes a monster, a monster? Digging deeper into the psychological basis for why different monsters scare us, and how to build a solid foundation for your monsters in fiction. Video gets the most clicks online, and if you’re promoting a book, you want to get as many clicks as possible. Book trailers can be an attention-getting promotional tool if you do them right. My book trailer got almost 30,000 views in a month. This workshop will give you resources for royalty-free stock footage, music, and graphics to make an arresting video piece that will drive traffic to your website and, more importantly, your order page. You’ll learn how to get low-cost help from college and art school film programs. We’ll discuss the dos and don’ts, view effective trailers and tacky trailers, and brainstorm ideas for your very own video baby. Writers need to stretch and exercise the right side of their brains just like we all stretch and exercise our bodies in order to stay physically fit and/or grow stronger. “The Cumulative Power of Words” is a warm-up exploring how the cumulative effect of words can create a visceral response. The second activity, “Exercising the Right Side of your Brain,” produces surprising, sometimes funny, sometimes nonsensical, but often amazing results. As the right side of your brain gets into gear, you will be ready to see things through an artistic mind and describe them in new ways. After all, description is imagery. Imagery is description. Using strong mental images in fiction can create powerful descriptions that pack an emotional punch. Strong minds and strong imagery are building blocks your fiction can’t live without! For more information, visit the Pikes Peak Writers Conference website. Peter M. Klismet, Jr. will be speaking about criminal profiling to SinC-Colorado members at our next chapter meeting/event, to be held Saturday, January 9, 2016 at noon at the Country Buffet Restaurant, 7475 Park Meadows Drive, Lone Tree, CO 80124. He is the author of FBI Diary: Profiles of Evil; FBI Diary: Home Grown Terror; and FBI Animal House (as PJ Kline). Pete will be selling books for $15 (cash or check)–and generously donating one for a doorprize! 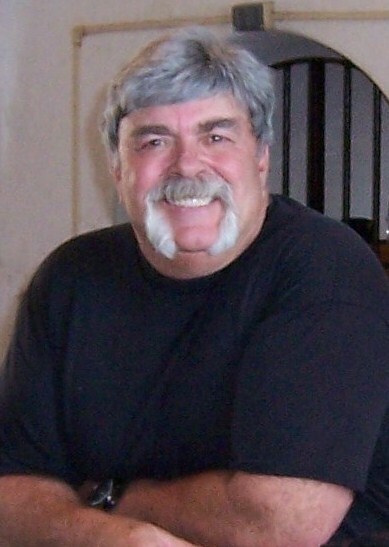 Bio: In 1985, a small cadre of FBI Agents were hand-picked to receive training in what was then called “Psychological Profiling.” Pete was fortunate to have been chosen to be a part of this elite group of original profilers. Extensive training followed, and in addition to his regular investigative responsibilities, Pete was the Profiling Coordinator for the Omaha Division which encompassed Iowa and Nebraska. Pete worked with agencies in the Midwest on violent crime cases in addition to training hundreds of officers in the newly-implemented “Psychological Profiling” program. For more information, please visit http://www.criminalprofilingassociates.com/Petes_bio.html. 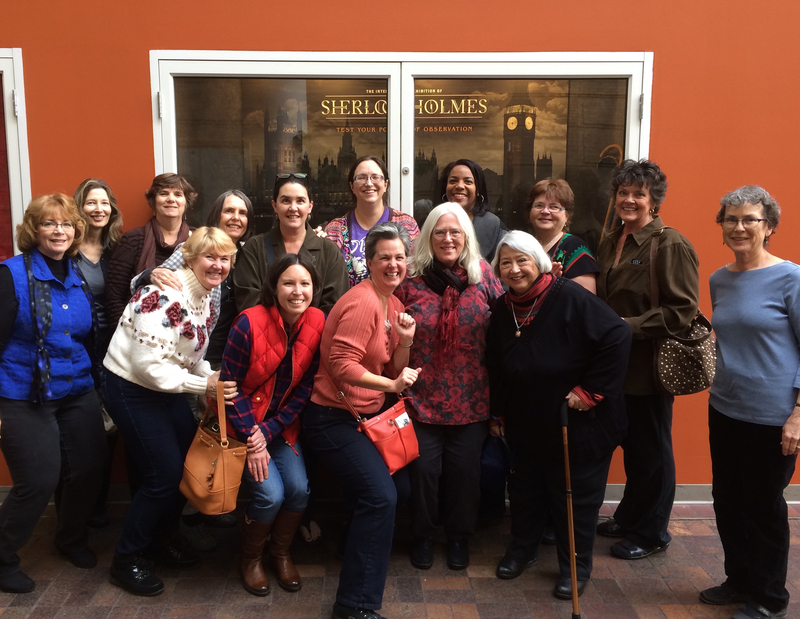 Featuring Sisters in Crime-Colorado members Catherine Dilts, Christine Goff, and M.L. Rowland. 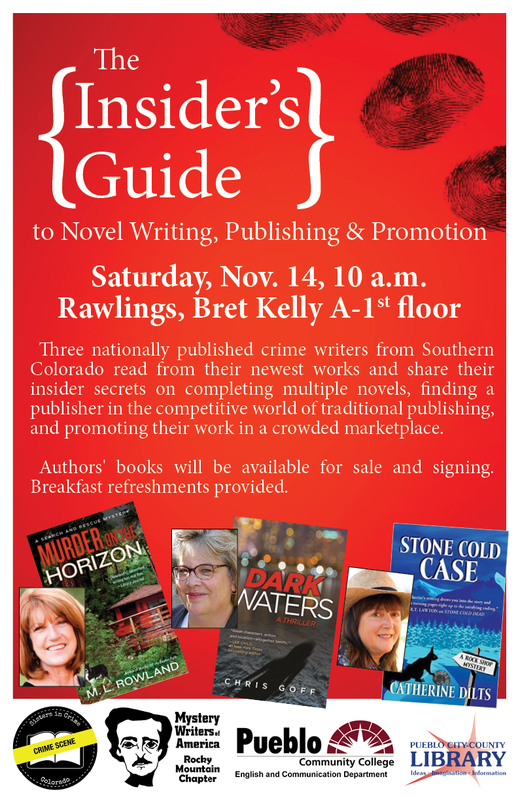 Co-sponsored by the Pueblo Community College Department of English & Communication, Sisters in Crime-Colorado (sistersincrimecolorado.org), and the Rocky Mountain Chapter of Mystery Writers of America (www.rmmwa.org). For more information: Sara Schwartz, Program & Events Manager, Pueblo City-County Library District, 719.553.0220. Congratulations to SinC-CO member Terry Odell, whose short story collection, Seeing Red, won the Killer Nashville Silver Falchion award in that category! Other finalists included CJ Box, Jeffery Deaver, and Craig Johnson, so Terry is especially thrilled to have been awarded this honor. For more about the author, please visit terryodell.com.